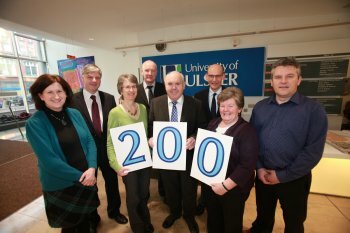 The University of Ulster is celebrating a major milestone after helping 200 companies to become more innovative through a hugely successful cross-border knowledge transfer project. Clonarn Clover, a free range egg producing and packing company in Co Cavan, has become the 200th company from the Republic of Ireland to partner up with the University in InterTradeIreland’s FUSION programme. FUSION is the first all-Ireland initiative to facilitate knowledge and technology transfer by linking companies in one jurisdiction with research institutions in another. The University of Ulster’s Director of Innovation, Tim Brundle, said: “One of the most exciting aspects of the FUSION programme is that it links industry and academia, and helps the knowledge exchange between them – and it does that in a very efficient way. Clonarn Clover has established the only egg breaking, pasteurisation and packaging facility in the Republic of Ireland and this second FUSION project aims to bring new liquid egg products to the Irish market and add value to egg shell waste. A number of Irish bakeries are already loyal customers because of the added convenience and food safety of eggs in a liquid form, and without the hassle of having to dispose of eggshells. Lead academic on the new project is Peter Mitchell, a Senior Lecturer in Food Technology at the Northern Ireland Centre for Food and Health (NICHE) based at the Coleraine campus. He also led the University’s input to the first project which added value to surplus and out-of-specification free range eggs. The project also increased operations management capacity and capability. He said: “As part of a multi-disciplinary University team, we will bring technical, operations, culinary and marketing expertise and years of egg sector support experience to help drive new product development and operational efficiencies in liquid egg which will add 35% to the company’s profit over the next three years. “NICHE has been a knowledge service provider to Clonarn Clover and 19 other companies in the food industry. Commenting on the project, Margaret Farrelly, Managing Director of Clonarn Clover, said: “Following the success of the first Fusion project we had no hesitation in linking up with the University of Ulster again. The first project played a vital role in developing our business and the second will be the continuation of what we hope will be a long-term relationship with the team at Ulster. An essential third element to the partnership is a high calibre science, engineering or technology graduate. The graduate is employed by the company and is based at the company throughout the project with mentoring from the research institution and an InterTradeIreland FUSION consultant. The FUSION programme provides funding to allow companies to collaborate with universities and colleges to access the skills and expertise that will help them develop new products to increase sales, enhance existing products to improve profit margins, and streamline production processes to reduce costs. InterTradeIreland offers support packages worth up to £44,250 (€52,800) for an 18-month project in the area of new product or service development, or £31,000(€37,000) fora 12-month project in the area of process improvement. The University of Ulster is the island’s leading provider of FUSION and has provided expertise from staff on all four of its campuses to companies in every part of the Republic. A wide variety of innovative projects have been completed including: designing a composite marine turbine blade for generating renewable energy from tidal streams; developing a range of convenient chilled and frozen high quality desserts and muffins with enhanced nutritional specifications; developing a nursery light that moves and projects images; and designing a new image capture system for the transfer of ultrasonographic images of the reproductive tracts of cattle. Caption: (L-R)Diane Fee, InterTradeIreland, Peter Grant, InterTradeIreland, Janet Johnston, University of Ulster, Alan Morrow, InterTradeIreland, Leo Farrelly, Clonarn Clover, Peter Mitchell, University of Ulster, Leo Farrelly, Clonarn Clover and Sean Nelson, University of Ulster.